"Media" is the plural of "medium." A medium is something, such as an intermediate course of action, that occupies a position or represents a condition midway between extremes; a specific kind of artistic technique or means of expression as determined by the materials used or the creative methods involved; a means of mass communication such as newspapers, magazines, radio or television. Communication is the exchange of thoughts, messages or information, as by speech, signals, writing or behavior. We use different types of media for different communication purposes. Some provide a shared (mass) experience. Some give a quick overview. 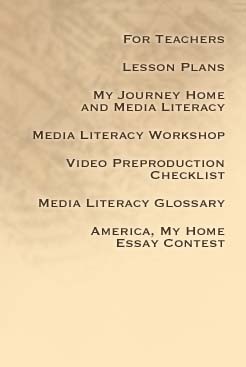 Using the chart above, have students select the type(s) of media that can be applied to the uses listed above. Discuss what the advantages or disadvantages are. Multimedia generally is associated with computers and videos, but it simply refers to a project created by using more than one expressive form (or medium). A collage in which kids outline their hand on a sheet of paper, and then write, draw or paint on the outline to express who they are, is a multimedia project. Producing a short video essay is also multimedia because it has both pictures and sound. With the introduction of the personal computer, the tools of multimedia have been put into many more people's hands, and with the Internet becoming so pervasive, we can now publish and share our work with millions of people around the world. New technologies do not replace traditional media, but they do provide more options. It is important to remember that visual communication is still a part of human communication. The first decision we have to make when we tell a story is to choose what medium is most appropriate to the message. Have students discuss the amount of time they spend watching television, reading print material (newspapers, books, magazines) on the Internet, etc. Discuss what activities they pursue on the Internet. Do they use the Internet for e-mail, gaming, shopping, surfing the Web. Have students develop a chart of the time they spend with various media. Is the time spent too much or too little? Have students evaluate if their time spent interacting with media could be used in a different way. 63% of Americans now go online. 52% of Internet users go online on a typical day. African-Americans and seniors are among the least likely to go online. African-Americans and Hispanics are among the least likely to say they use e-mail. African-Americans and Hispanics are among the most likely to use online discussions and chat rooms. Parents are more likely than non-parents to use the Internet. Young adults pave the way with online communication tools like IM and chat, and continue to lead in most hobby and entertainment activities.